We’d love your help. Let us know what’s wrong with this preview of Survivor by Kayla Marie. To ask other readers questions about Survivor, please sign up. I knew the author was going to bring me on an emotional journey before I started reading. I prepared myself for the obvious storyline of the book however I'm still coping with others. Avery is a upcoming Nashville star when the unthinkable tragedy touches her life. With the help of her sister she's able to heal physically but still has emotional scars. With her guard down Reid strolls into her life. Reid hasn't been lucky in love but that's about to change. He fits easily into Avery's life. The pair enter into a quick relationship. They are at a comfortable stage in their relationship when the author drops an emotional bomb. I found myself yelling quite a bit at the last half of the book. I couldn't believe the author went there. While I am still trying to put my emotions in check, I found the book worth the read and enjoyed this new to me author. Avery was surviving. Trying to. Sort of…. Reid, with his gentle but persistent pushing, was going to challenge her to do more than that. To feel more. Both looked at love as something for other people, not feeling it was something they deserved. How could they both move forward? And would it be together? Whew… Does it sound like a soap opera? If it does, it should sound like only the best kind! This story was full of drama and heartbreaking emotion as both struggled to live their life in a way that was meaningful but definitely without love. Both had heart and soul as they struggled with their pasts, with their present and the family that supported and pushed them. This was not a laugh out loud kind of read but at the same time there was a lighter side with fun banter having me smile often. “So, can you tell me what happened?” he asked. Sweet Home Dixie series gives one more heartfelt romance that has more than just romance. Its a journey of loss, pain, sorrow, deceit, betrayal, and then coming back to trust, accept, admire, and yes, love again. This was a second chance romance for two different people from two different perspectives. Avery's loss of her love was debilitating. She had to come back from the brink of bleak and begin to live again. She just was not prepared for Reid. Reid was a different kind of man than he began. Sweet Home Dixie series gives one more heartfelt romance that has more than just romance. Its a journey of loss, pain, sorrow, deceit, betrayal, and then coming back to trust, accept, admire, and yes, love again. This was a second chance romance for two different people from two different perspectives. Avery's loss of her love was debilitating. She had to come back from the brink of bleak and begin to live again. She just was not prepared for Reid. Reid was a different kind of man than he began. He was the dream boyfriend until deceit and betrayal took all that from him. He felt his path laid with one night single status. That was until Avery. The two together presented a challenge to the other. There easy flow together made it a valued relationship. There is nothing like a snowy day to put me in the mood to curl up by the fire and make a return trip to Mason, Alabama. Like Kayla Marie’s debut novel, Survivor pulled at my heartstrings. Reid's and Avery’s story comes to life beautifully. Both have experienced the kind of heartbreak that leaves permanent scars but Kayla Marie deftly takes her readers on a journey through pain and healing in such a beautiful way. We’ve met Reid before – his character in Survivor is richly developed. At a crossroa There is nothing like a snowy day to put me in the mood to curl up by the fire and make a return trip to Mason, Alabama. 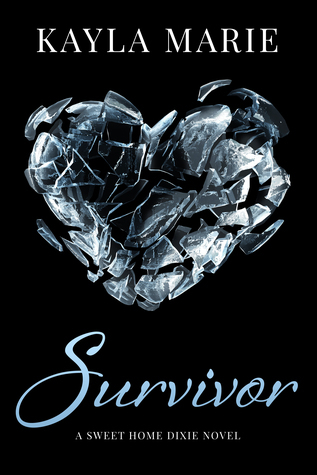 Like Kayla Marie’s debut novel, Survivor pulled at my heartstrings. We’ve met Reid before – his character in Survivor is richly developed. At a crossroad in his life, he meets Avery – beautiful and snarky and she derails his status-quo behavior with one look. Avery has returned home to Mason, to live with her sister after the most devastating trauma. Falling in love isn’t in her realm of contemplation but the attraction between these two characters is immediate and intense. Both characters have individual story arcs that clearly demonstrate that heartbreak can happen to anyone, at any time. But sometimes the unexpected can steer the way to healing and love. Avery & Reid, two people touched by tragedy that changed their lives in measurable ways. With pasts that broke them, changed them and made them different people than they once were, expectations changed and they both have learned to adapt. For Avery that means being alone, undeserving of love and never allowing herself to experience the life most people dream of. For Reid that means not emotional attachments to women, one night stands work just fine for him......until they dont. Follow Avery and Avery & Reid, two people touched by tragedy that changed their lives in measurable ways. Follow Avery and Reid as they navigate love, loss, lust, acceptance and foregiveness. Avery was easy to love, learning her tragic past made each day she woke up and got out of bed more precious. Reid I was a bit slower to warm to given his past but he ended up being one amazing man! This is book #2 in the Sweet Home Dixie series. This is my first book by this author. Avery is a survivor. When Avery meets Reid, there is something there. Something healing for the both of them. Each has dealt with lose in a different way. We are all survivors of something. Whether it be from an accident, surgery, cancer, or a life changing event. We all had to pick ourselves up and start fresh. I also think we all have secrets that we do not want to share with those around us. This book helped me see that being a Survivor is not a bad thing. The things we go through only make us stronger. Survivor, book 2 in the A Sweet Home Dixie series by Kayla Marie. It's a standalone, so you don't have to read book 1 first. But it wouldn't hurt! I loved the storyline, I thought Avery and Reid was well developed characters. I really liked this book! Avery Gibson are back home, working behind a bar, and trying to find herself after losing everything in a tragic accident. Reid Hudson, a ladies man, finds the redhead behind the bar alluring. But can they trust each other? Is it lust, or is it someth Survivor, book 2 in the A Sweet Home Dixie series by Kayla Marie. It's a standalone, so you don't have to read book 1 first. But it wouldn't hurt! But can they trust each other? Is it lust, or is it something more? A great love story! Fell in love with Reid! Drawn in from the very beginning. Written well, kept me captivated. Quick great read. Avery and Reid both no tragedy. They are both strong people but really the are just going through the motions of life and not really living. Reid has issues of trust and Avery sees a total bad boy full of trouble. When Reid charms his ways into her life, she really just wants him and a chance to live life in happiness. Can these two trouble souls find happiness or will they continue to be stuck in the past. Beautiful read. I loved the story line and these two characters. This book is riveting, enthralling and absolutely awesome! It's suspenseful and readers will love it! Avery and Reid both no tragedy. They are both strong people but really the are just going through the motions of life and not really living. Reid has issues of trust and Avery sees a total bad boy full of trouble. When Reid charms his ways into her life, she really just wants him and a chance to live life in happiness. Can these two trouble souls find happiness or will they continue to be stuck in the past. Beautiful read. I loved the storyline and these two characters. Reid has been the “love-em-and-leave-em” type ever since he realized that he was never going to have the real thing. Just as he was about to make another score for the night, he notices the new bartender and is intrigued by her. Where has he seen her before? And why does she seem so unaffected by his Southern charms? When Avery decided to move back into her old town, she’d swore she’d never get close to anyone ever again. But then she runs into Reid, who makes her tingle in ways she’d never imag Reid has been the “love-em-and-leave-em” type ever since he realized that he was never going to have the real thing. Just as he was about to make another score for the night, he notices the new bartender and is intrigued by her. Where has he seen her before? And why does she seem so unaffected by his Southern charms? When Avery decided to move back into her old town, she’d swore she’d never get close to anyone ever again. But then she runs into Reid, who makes her tingle in ways she’d never imagined. Still, she refused to let him get to her in any way. The first part of the book dealt with the two denying their attraction for the other in a typical chick-lit fashion. But then we soon dive deeper into the emotional ties of these characters. Reid can’t seem to forgive himself for the mistakes he made on his last relationship and Avery can’t shake off the emotional and physical scars from that horrible accident. There is nothing more crippling than Survivor’s Guilt. Throughout the book, the two engage in a montage of fun and courtship that opens their hearts to trust and love. Ultimately, the story is about loss and regret, but also healing and moving forward. Well-written, for the most part, story is charged with an emotional complexity that gave the characters depth; however, it also carried a somewhat languorous pace. After reading the first book in the series, I am quite familiar with Ms. Marie’s knack for tugging at heart strings, but I just felt that the emotional weight might’ve lingered a bit too much. Of course, I have no doubt that readers would be able to find a connection. The second in the series, but where "Mended" only introduced the readers to Reid, this one, takes his story to a whole new level. This is the kind of book you just want to curl up with and read, totally engrossed in the story. I like Kayla Marie's writing style, and it fits with the journey of falling in love. The characters truly grow within the story, and the author's writing makes you feel like you're right there in the middle of the story. It tugs on your heartstrings, but it's so worth the read. This is one that will pull every which way at the heart strings through the emotions. This is also the first time reading this author. It centers around Avery and Reid with them getting a chance at a different kind of second chance. That was a refreshing part of this along with loving the location. Both are intense in character that stand up. They will have a air of mystery that will weave in and out. You can do nothing else but follow them to see where it all goes. First off what a great cover for this book. I picked this book up and it has all the feels, you get the highest of highs and the lowest of lows. What a ride this book takes you on. Can a person change their ways once they are pegged to be a certain way? This is the second book in the series but can be read as a stand alone. I received this ARC for a fair and honest review. Loved this book!!! Definitely needs to be on your list of books to read! Could not put this book down. Took some turns I was not expecting, tugged at the heart grabbing hold of the emotions.